If you're searching for the perfect Mother's Day gift idea, we've got you covered! Everybody wants to find the perfect gift for mom—something that she'll love, treasure, and actually want to display. 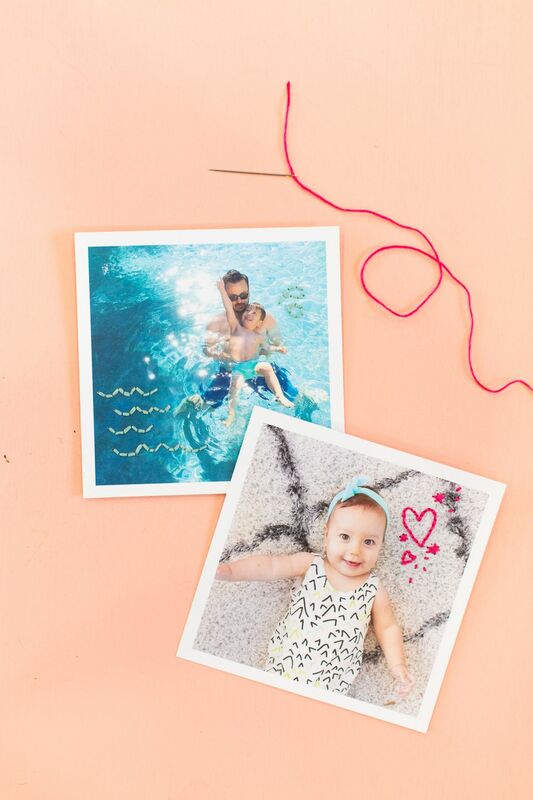 This year, skip the usual ideas and create something personal and charming with these embroidered photographs! They're simple to make and full of a whimsical joy that is so contagious. As you're gathering your materials, try to find photos that have a little bit of space on them to create your embroidery. It's also great to find photographs that you could add a "drawn" element to -- steam rising from a cup of coffee, waves on water, clouds in the sky, and so on. Use your imagination when it comes to your embroidered elements, and mom will love it! Start by lightly sketching your images on each photo. Consider the scale of the images that you're drawing and don't let them overwhelm the photograph, but don't let them get so small that the embroidery thread will look messy. Use the tip of your embroidery needle to poke guide holes along the lines of your drawing. These holes should be approximately 1/8 inch apart, to help "trace" the lines of your drawing with your embroidery thread. Prepare your embroidery thread. Standard embroidery thread comes with six thin strands interwoven; split this in half and separate three strands out. Cut a length of about 3 feet. Thread the three strands through your embroidery needle, pull the ends so that they're even, and knot them off so that there is a thick knot at the end. Begin embroidering. Start by inserting your needle through the endmost hole in your design, coming up from the back and through to the front. Then find the next hole and insert it from the front to the back. You can see this technique on the dotted line trailing behind our paper airplane in this photo. Most of your designs will be outlined with a backstitch. We used this technique on the paper airplane on this design. Start by creating your first stitch as described above. Then, skip a hole and come up from the back of the photograph into the next hole. Once your thread is in the front of the photograph again, insert it through the hole you skipped, creating a backstitch. Continue in the same manner (skip a hole, come up through the back, insert through the skipped hole) until your entire design is outlined. Once your design is outlined, tie off the thread at the back of your photograph and trim the extra. Give to the moms in your life and enjoy! 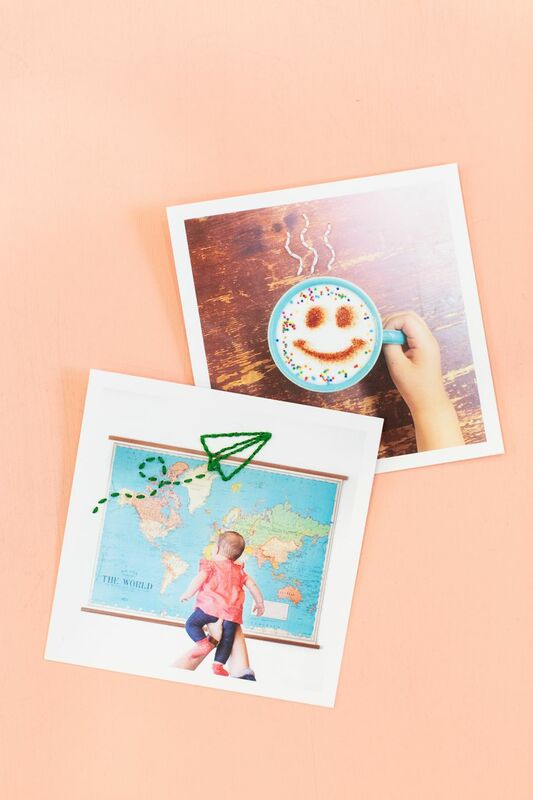 These are wonderful as Mother's Day cards (glue a backing on it to hide the stitches and so that you can write a little message), or framed as art. No matter how you give it, mom will love it!